ATB 5 oz - Bullion. ATB 5 oz - Tube. ATB 5 oz - Graded. 90% Silver Proof Half Dollars. First Spouse 1/2 oz Gold Coin. Quarter - State Territory Sets. 999 Silver Republic of Chad Queen Nefertiti by Scottsdale Mint. 5 oz Republic of Chad Queen Nefertiti 2017. This third release in the incredibly unique and popular Egyptian Relic Series, produced by Scottsdale Mint for the Republic of Chad, features Nefertiti, Queen and Chief Consort (wife) of Pharaoh Akhenaten. The coin's design is based on actual ancient hieroglyphs, and incuse engraved, with added hand-brushed antique finish. The obverse features Queen Nefertiti, as often depicted in ancient hieroglyphs. A sculpted bust of Nefertiti produced during her lifetime still remains in excellent condition, providing a glimpse of her magnificent beauty. The realistic design is displayed both in the incuse style minting, as well as the finely antiqued finish. Even the irregular cracks running through the design replicates how the hieroglyph's original condition would appear. The reverse of each coin in the series displays a large, finely engraved image of the Republic of Chad's coat of arms. Encircling the image at the rim are the inscriptions, Republic Du Tchad 5 Troy Oz 3000 Francs CFA. Immediately below the coat of arms is the the release year. Incuse design is when an image, which might normally be engraved to be raised above the coin's surface, is rather struck to be recessed into the surface. This release makes a beautiful contribution to the Republic of Chad Egyptian Relics Series! Dimension: 41mm x 11.8mm. Struck in an incredible rimless, incuse design, with a hand-brushed antique finish. Each 5 oz coin is packaged in an attractive gift box, designed for the series. Limited Mintage of only 30,000. Obverse: Features a realistic depiction of the beautiful Egyptian Queen Nefertiti, as she is pictured in ancient hieroglyphs. Reverse: Displays a large, finely engraved image of the Republic of Chad's coat of arms, with inscriptions "Republic DU Tchad, " the release year, weight, purity, and face value. Do you want to learn more about the history of ancient Egyptian Kings, Queens, and deities as featured in this amazing coin series? Here is a good place to begin. Scottsdale Mint stands tall as one of the most highly regarded and globally recognized private mints in the industry. Based company, Scottsdale made an unflinching commitment to quality consistency in every step of their business and manufacturing processes. With ISO 9001 certification, they are prepared to bring together innovation, creativity, quality, and efficiency into their finished products. Investors in precious metals demand the finest and the Scottsdale hallmark provides the name and backing for peace of mind! Scottsdale is often envied by their peers for some of the most stunning and unique series designs in the private sector. The impeccable skill of their creative staff is clearly displayed with each new coin released. Though other mints may envy, Scottsdale customers anxiously await each release of their favorite series! Their anticipation is never disappointed. Scottsdale Mint has also established themselves in the global market. Providing creative design and minting services to smaller nations around the world, they produce those countries' legal tender bullion coinage. BOLD Precious Metals is honored to be among Scottsdale's prestigious list of Authorized Dealers, and proud to offer many of their products at some of the lowest prices available! The item "2017 5 oz. 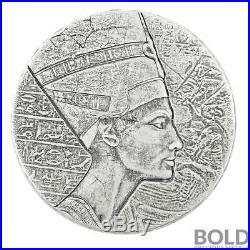 999 Silver Republic of Chad Queen Nefertiti by Scottsdale Mint" is in sale since Friday, December 8, 2017. This item is in the category "Coins & Paper Money\Exonumia\World". The seller is "boldpreciousmetals" and is located in Austin, Texas. This item can be shipped to United States.